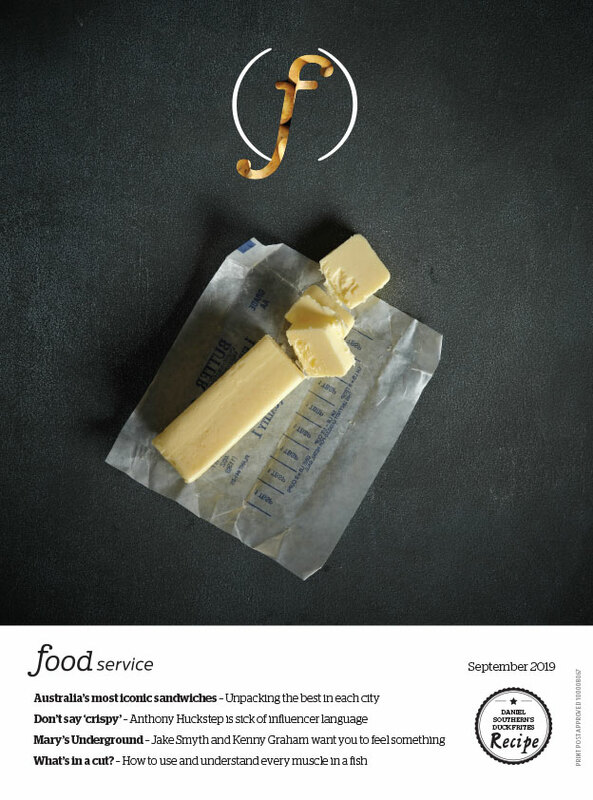 As the Australian foodservice sector continues to out shine itself in terms of new and exciting fare, flavours and flair, it is easy for the classic and the simple to go overlooked. But no longer! Foodservice magazine’s annual Dish of the Year competition celebrates the quiet champions of our casual dining sphere. Following the casting of votes by both the industry and the public across five different categories, our team of judges have spent the past few months eating in venues across the country. The looked high and low for dishes that bring to the proverbial table creativity, vibrancy and just damn deliciousness. And they have made their final decisions. Who scored the top gongs for 2017? Burger Got Soul's Tassie Tempter, foodservice's 2017 Best Burger. Place the pattie on a hot grill and cook for 5 minutes. Flip and grill for another 5 minutes so that it’s cooked in the centre but remains juicy. Meanwhile, add the bacon to the grill and cook until crispy. Heat a small frying pan over a medium-high heat, crack the egg. Cook for 2 minutes or until cooked to your liking. Cut the bun in half and toast lightly. Next, coat the base with a tablespoon of tomato relish. Then add the beef pattie, crispy bacon, cheddar cheese, egg, beetroot, tomato, and lettuce. Coat the top bun with mayonnaise. Serve immediately. Blu by Australian Seafood's grilled barramundi combo, foodservice's Best Fish & Chips 2017. Prepare the barramundi by sprinkling the fillet with salt and pepper, and then dust with flour. On a hot grill, add a good lug of oil before placing the fish and cook for 2 minutes. Flip and cook for a further 2-3 minutes, or longer for crispy skin. In a deep fryer, cook a serving of chips until golden brown. Remove and allow to drain. To serve, place the fillet of barramundi on a plate with the chips on the side. Drizzle over with the lemon sauce. To make the pizza base, combine the flour, yeast and salt in the mixing bowl of a stand mixer. Stir before adding the water. With a dough hook, mix on low for 18 minutes. Then allow to proof for 36 hours. Shape the dough into ten balls, cover and let rest for another 12 hours in a cool spot. When ready, carefully take out a dough and gently stretch into the desired shape for the base on a baking tray. Heat a saucepan on a low heat, and add the extra virgin olive oil. Add the garlic and cook until golden. Add the rest of ingredients and cook for 15 minutes. Remove from the heat and blend. Set aside to rest for 12 hours. Preheat the oven to 400-450ºC. On a stretched out pizza base, spread the porcini sauce evenly and sprinkle over with some fior di latte cheese. Place the pizza tray in the oven and bake for 90 seconds. Top the pizza with several slices of the Prosciutto di Parma. Add a handful of rocket leaves to the middle, and drizzle white truffle oil. 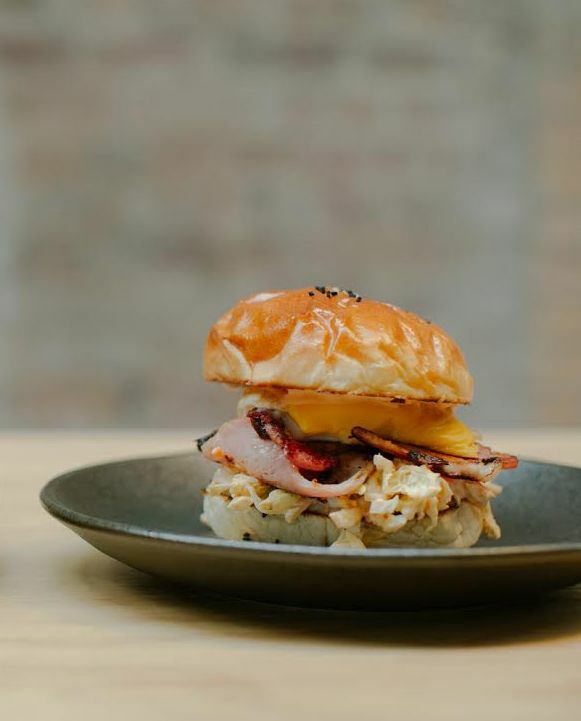 Rising Sun Workshop's hokkaido milk bun with bacon, egg, cheese and kimslaw, foodservice'sBest Breaky Roll 2017. To make the the starter, begin combining all the ingredients in a saucepan and whisk until no lumps remain. Place the saucepan over medium heat for approximately 5 minutes. Whisk continuously until the mixture thickens and the whisk leaves ‘lines’. Remove from the heat and transfer the starter to a small bowl. Directly contact cling wrap the mixture and allow to cool to room temperature. In a stand mixer bowl, add the flour, milk powder, yeast, sugar and salt and mix well. Add the starter, egg, milk, butter and cream. Using the dough hook attachment, knead on low for 5 minutes. Then increase speed to medium for a further 5 minutes. Cover with plastic warp and rest for 1 hour. Line a baking tray with greased paper. Divide the dough into equally shaped balls, roughly the size of a tennis ball and arrange on the tray. Cover with plastic wrap and rest for 40 minutes. Preheat the oven to 180ºC. Brush the dough with the cream and sprinkle the seeds over the top. Bake for 35 minutes or until internal temperature reaches 87ºC. Rising Sun Special Sauce: 1 cup Japanese mayonnaise, 1 tbsp Knorr Aromat seasoning, 2 tbsp Sriracha. In a small bowl, add all of the ingredients and mix well. Set aside. Begin by making the Rising Sun special sauce. In a small bowl, add the Japanese mayonnaise, Knorr Aromat seasoning and Sriracha. Mix well and set aside. To make the kimslaw, purée the kimchi in a small bowl. Add the shredded wombok and combine well. Set aside. Cook the egg in an immersion circulator for 45 minutes at 64ºC. Heat a pan on low heat and melt a small knob of butter. Cut the buns horizontally and toast in the pan. Remove from the heat and keep warm. Fry the bacon till crispy. Crack the egg into the pan and sear on one side. Carefully flip and top with a cheese slice. Sear until the cheese has melted over egg. To assemble, cover the bottom bun with kimslaw. Add the bacon, then the cheesy egg. Squirt a little extra special sauce on top and cover with the top bun. Henry and the Fox's Toulouse sausage salad with champagne vinaigrette, foodservice's Best Salad 2017. Begin by making the thyme croutons. Preheat the oven to 170ºC. Thinly slice the baguettes into 16 pieces, and placed the bread on a baking tray. Over the top, brush with the butter and sprinkle all over with sea salt and the thyme leaves. Bake for about 15 minutes, or until golden and crisp. Remove from the oven and allow to cool. Roughly cube and set aside. In a medium-sized bowl, combine all the ingredients for the dressing and emulsify. Set aside until required. To make the salad, slice the Toulouse sausages and grill. Next in a large bowl, add the spinach leaves, goats cheese, cherry tomatoes, red onion, cornichons, croutons and once cooked, the Toulouse sausages. Toss and divide between four bowls. Drizzle over dress with the champagne vinaigrette and serve.